It’s been difficult to keep up with the crime wave created by the Occupier crowd. At the Occupy Los Angeles encampment outside City Hall one woman was arrested for setting another person’s clothes on fire and another for hitting a man over the head with a tent pole. Both were booked on the felony charge of suspicion of assault with a deadly weapon. And that’s not all! The Los Angeles Times story by Kate Linthicum adds: “Also Friday, police arrested a man on suspicion of climbing a tree and dumping fluorescent paint on a historic marble fountain that the city barricaded earlier this week to protect from vandalism.” Sounds like all this peaceful protest might get out of hand some time soon. 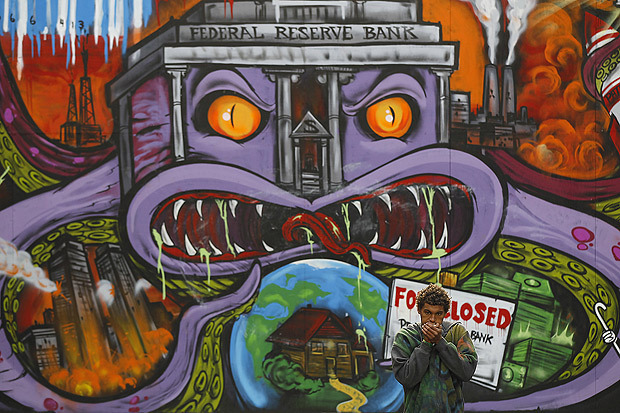 The image at the left derives from the Occupy Los Angeles encampment. According to the Times photo caption, a man who calls himself “San Diego” warms his hands from an afternoon chill moments after a rainstorm. As the New York Times might say, Mr. Diego was unavailable for comment on the arrests. And that’s not all! “The protesters clashed with police and rescue crews when they arrived at the scene. Protesters also harassed camera crews who were reporting the story.” Jim posts the video below of the protesters harassing a local camera crew and lashing out at police.